Eukanuba Veterinary Diets Intestinal for Puppies is a complete food , intended to reduce acute intestinal absorptive disorders, during periods of and recovery from acute diarrhoea. Intestinal for Puppies contains increased levels of electrolytes and highly digestible ingredients. Contains a fibre blend, including beet pulp, MOS and prebiotic FOS. This formula helps support the natural balance of the intestinal microflora and helps optimise nutrient absorption. The protein, fat and DHA levels have all been adjusted to promote healthy growth and development. In addition, this diet provides all the nutrients needed to support the overall health and well-being of your puppy. Intestinal for Puppies can be fed for 1-2 weeks for acute intestinal disorders, or 3 to 12 weeks as a compensation for maldigestion, or for a lifetime in cases of chronic pancreatic insufficiency. For any extended use we recommend that you consult your veterinarian. It is recommended that a veterinarian's opinion be sought before and during the use of this product in order to determine the needs of your puppy. 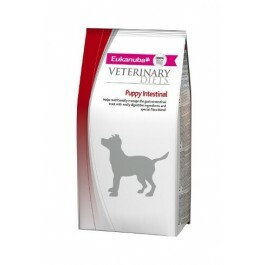 Eukanuba Veterinary Diets Intestinal for Puppy helps nutritionally manage the gastrointestinal tract with easily digestible ingredients and special fibre blend. Intestinal for Puppy can be fed for 1-2 weeks for acute intestinal disorders, or 3 to 12 weeks as a compensation for maldigestion, or for a lifetime in cases of chronic pancreatic insufficiency. For any extended use please consult your veterinarian. Intestinal for Puppy is intended for the reduction of acute intestinal absorptive disorders and as a compensation for maldigestion. It is recommended that a veterinarian's opinion be sought before and during the use of this product in order to determine the needs of your puppy.